On our cycle tour of rewilding areas in Europe, our second stop was Muntanya d’Alinyà, a living mountain in the Catalan Pre-Pyrenees. Muntanya d’Alinyà is one of the largest private nature reserves in Spain and member of the European Rewilding Network (ERN). 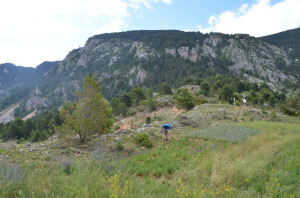 The ride for rewilding goes on at Muntanya d’Alinyà, Spain. Dave Renner / Blog author: For people. For nature. During the end of June we have been climbing gradually into the Pre-Pyrenees for several days when we could finally turn off the main road. We followed the sign to Alinyà onto a small mountain road and straight away started a steep climb. We entered the valley filled with trees allowing the sight of the green mountains rising up on either side of the river. Rocky outcrops emerged from the mountains erratically and at different angles. 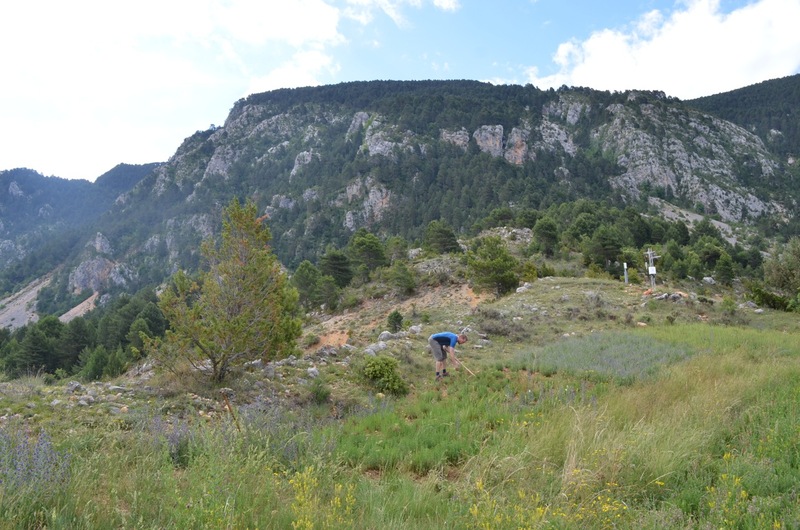 The geology in the Pre-Pyrenees is partly what makes it so great for wildlife. The vultures love to nest in the rocky cliffs and mountain goats can roam freely, away from people. We rode slowly up the steep road in the sunny afternoon, soaking in the landscape. The villages in the area are very old – we ate lunch by a church built in 1051! Many people have left the area in the last 40 years and much of the farmland is abandoned, but there are still people living here. Some live a modern version of the traditional lifestyle, growing their own food on the mountain. Our home for a week at Muntanya d’Alinyà, Spain. Silvia works at the visitor center and lives in Alinyà with her family. She welcomed us when we arrived, introduced us to the area and showed us our home for the week – a beautiful stone building with a gorgeous view, used by visiting students. On our first evening, we went to the local restaurant and met Xavier, who co-ordinates the team at Muntanya d’Alinyà. He told us all about the origins of the reserve, explained about the current work going on at the moment and spoke about the future plans. 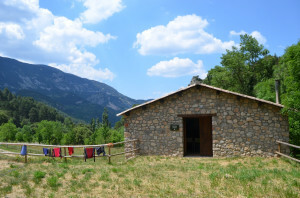 Muntanya d’Alinyà is owned, managed and funded by a Fundació Catalunya La Pedrera, but has also started to generate revenue from tourism by opening a visitor center in Alinyà village and photography hides at the vulture feeding stations. This is helping to secure the future of the conservation work here. As long as the visitors continue to leave no trace, they are welcome! We stayed for a week and felt very welcome by everyone who works there. During our stay, we went hiking, tended the aromatic herbs, visited the forestry area, learned about the work going on and saw hundreds of vultures! There are fantastic hiking trails all over the mountain that we recommend to visit. If you can organize a visit to one of the vulture hides and watch the birds up close you would have a spectacular experience. 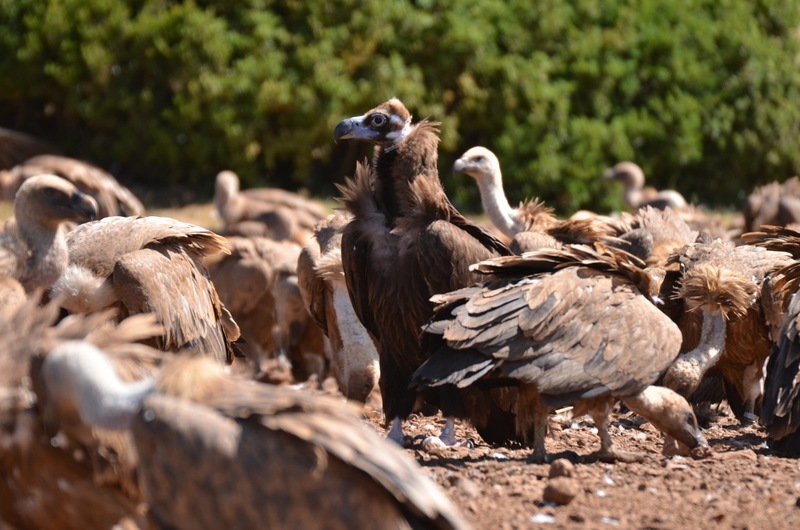 Black vultures and Griffon vultures from one of the photography hides in Boumort, Spain. There are four species of vulture in Europe and this is one of the very few places where you can see them all! Muntanya d’Alinyà and neighboring Boumort reintroduced black vultures, and now there is a population of almost 50 birds. The aim of the reintroductions is to connect populations in France with those in western Spain with the ultimate aim to have a completely connected population across Europe! The re-introductions have been very successful and the population is nearly ready to be self-sustainable. Supplementary feeding continues for the moment together with the constant monitoring of the birds. When a black vulture raised here is released, it goes exploring the territory before settling down to pair up and breed. During the exploration time, each bird can travel up to 10,000 km every year! The GPS tracker on one particular female showed her travelling to Spain, Portugal and France before returning to Muntanya d’Alinyà to find a mate and build a nest. There has even been some promising mixing with other populations – one pair has a Spanish female and a French male. We were observing black vultures from a hide at Boumort, the neighboring reserve and even saw some elusive bearded vultures on the hillside, waiting for a quiet moment to come down and feed. Dave tending the aromatics plants in Alinyà, Spain. Anna Heslop / Blog author: For people. For nature. As well as vulture re-introductions and eco-tourism, we learned that there is an area of Muntanya d’Alinyà where forest management is taking place. This is a not-for-profit social enterprise, employing local people with disabilities. The workers take down trees and prepare them to board onto logging trucks. The forest products here are some timber and many wood chips for biomass. The quality of the wood is poor compared to commercial forests managed solely for timber. This region has been regenerating naturally with young trees that are not consistently straight or large enough to produce good quality timber. The forest is re-growing like mad in the Pyrenees where people have abandoned hill farms. Only 65% of the re-growth is harvested annually, which means the forest is spreading. Large herbivores, storms, landslides and wildfires would once have maintained a dynamic mosaic of habitats here. Humans have killed many of the animals and cut down the forest, now the forest is growing back but without many of the processes that were in place. One of the aims of the forestry management is to maintain some areas of open grassland to allow natural grazing by wildlife. I hope that one day the mountain will be full of wild animals again and this will no longer be necessary! By the time we had spent a week at Muntanya d’Alinyà, we were ready to buy a house there! Nevertheless, there are more roads on the way waiting for us to ride them and more landscapes to explore, so our trip goes on. 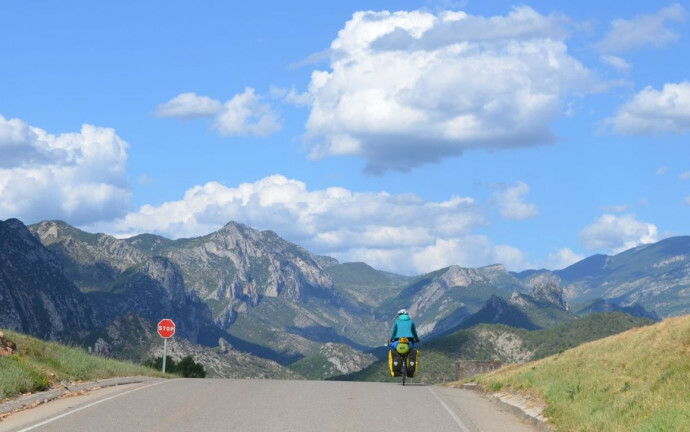 We are going to ride across the Pyrenees, get a train to Milan and cycle into the Swiss Alps and from there head to Germany visiting other members of the European Rewilding Network on our way. The Swiss National Park is protected from human intervention for already 100 years and we will be interested to see how it looks! You can follow our journey at www.forpeoplefornature.com where we are blogging and writing articles on the way. To find out more about European Rewilding Network click here.